Just before January morphs into February a chance to join in Wellywoman's new meme being run together with Sue over at 'Backlane Notebook', on the subject of 'Scent In The Garden'. This is a theme that I find fascinating and I've always tried to bear scent in my mind when thinking about what to grow. It's much too cold here at the moment to stick my nose out in search of scent. So for this month, here is a brief run through of three books lurking in my bookshelves, which have provided me with suggestions for scent in the garden over the years. There are beautiful illustrations throughout by the botanical artist Patricia Dale, although I confess to wishing that there were more of them. Sadly from what I can gather the book is no longer in print but it's possible to track down second hand copies. An appendix has useful lists of plants with scented leaves, plants with scented flowers, scented plants for each of the seasons, scented plants for evening and night, scented plants for cutting, scented plants for indoors and scented plants for outdoor tubs. The book is well illustrated throughout with plates of paintings, photographs as well as line drawings. Again this book is no longer in publication but second hand copies can be obtained from second hand bookshops and online sources. It is this book where I first came across the concept of forcing winter bouquets so that you could enjoy both scent and colour at close quarters indoors. Magic! The third book is Jenny Joseph's 'Led By The Nose'. The author is better known for her poetry especially the brilliant 'When I am an old woman, I shall wear purple'. The day draws ever closer for my wardrobe! This little book takes you through the calendar year in terms of not only scents that you might encounter in the garden but also the various cyclical activities that goes on in most gardens. There are various lists at the end of the book, including what you might be able to smell each month. The list for January is thinner than it is for many other months but there is still a surprising number of scented pleasures to be savoured. The book concludes with various lists including a most comprehensive list on scented roses as well as an essay on smell. This book is perhaps easier to get hold of than the others and is also available on a Kindle or ebook format. I'm hoping to pick up more delightful fragrant suggestions as the year goes on thanks to Louise and Sue. Well the temperature soared to the dizzy heights of 12 degrees centigrade in the greenhouse today and my special snowdrops in the greenhouse were singing. It was the ideal day to inspect all the pots of 'drops that are open as well as those about to open and a chance to take a few more photos. Thanks for all the lovely comments and encouragement that have come my way recently about my snowdrop photos. I still think that there is room for improvement so was pleased to get hold a thin piece of black foam from an art shop on Friday which I can now use as a backdrop. Before then I had been using black card, pegged on to some stiffer cardboard, which occasionally toppled over threatening to behead snowdrops as it did so. The black foam can be propped up without anything behind it and has so far been reassuringly stable. It also seems to photograph as black rather than a murky shade of charcoal grey as the card sometimes did. I've also been asked if I have favourites. This is a hard question to answer but probably my favourite is 'Diggory' (not pictured here) although most of the above would be close runners up if it came to a competition. Morever three of them - 'Augustus', 'John Gray' and 'Lady Beatrix Stanley' can all be obtained at prices that will not break the bank. 'Augustus' is not quite open yet but I so love the dimpled petal exteriors. I'm also waiting with anticipation for a couple of new purchases to flower for the very first time so who knows my favourite may yet be usurped in a few days time. Watch this space! Back in the greenhouse on Monday afternoon where it is definitely cooler than yesterday. I snipped a trio of flowers from Galanthus 'George Elwes' as they have been rather floppy for a couple of days. To this a few sprigs of ivy, some cornus or dogwood twigs and a flower from helleborus 'Christmas Carol'. This turned out to be a work in progress as I've returned to it to insert a few twiggly bits of a pink tinged winter heather. However it is too gloomy out there now for another photo as well as being perishingly cold. You can see many more vases today over at 'Rambling In The Garden' hosted by the lovely Cathy. A great way to dispel the winter blues! Just one glimpse of the outer world today - the very first hellebore to arrive at the party. There are other plants carrying plump buds but they seem reluctant to flower. I'm not surprised as it's still perishingly cold and windy, so I've kept relatively warm to celebrate Garden Bloggers Bloom Day venturing in to the greenhouse to capture a handful of my 'special' snowdrops. 'Lost Label' is a double possibly 'Ophelia' which I've bought in the past but then it could quite possibly be something else. All suggestions welcome. Thanks to Carol over at May Dreams Gardens who kindly hosts 'Garden Bloggers Bloom Day' where I'm sure there will be all sorts of winter gems to tempt and tease. I've been wondering when the new tree following year starts so have been looking back at my blog posts. It turns out that it was in March 2014 so my willow still has another month in the spotlight. I must apologise for not posting in December. I'm not quite sure what happened then. At first glance it seems that the willow is just the same as when I last posted in November, apart from the fact that it is now definitely leafless. 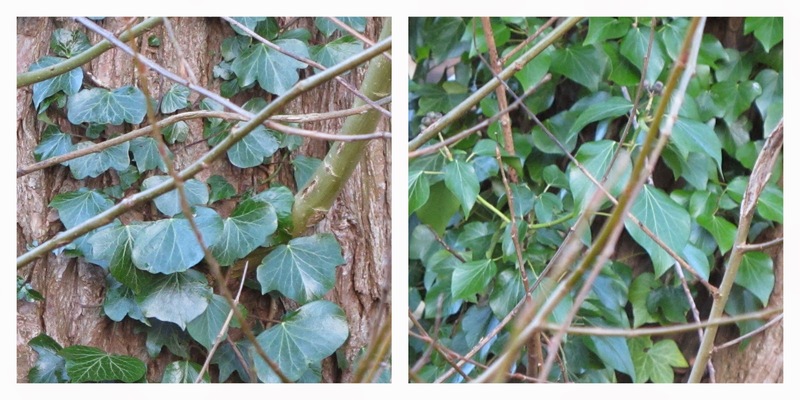 However when I looked closer at the trunk I noticed that the ivy growing up the bark is not just one variety but two. This shows just unobservant I've been over the last thirty years - hangs head in absolute shame! So a big thanks to you Lucy for opening my eyes to the smaller details. I also noticed when taking the photos yesterday that there are daffodils fully open on the other side of the stream. This gave me such a shock that I nearly fell into the stream. I've never noticed them open so early in the year, let alone before the clumps of snowdrops that grow alongside have opened. Visit Loose and Leafy to see what fine tree specimens from all over the world are up to this January. The weather has been interfering with play so far this year. I can do cold but I can't do cold and windy. No matter how well wrapped the wind seems able to permeate and cause havoc. So apart from nipping to the greenhouse and the odd quick reccie of the garden I've been devoting time to indoor activities. I have been doing some gentle digging whilst sorting out the folder of family information that came into my care after my Dad's death. He had managed to trace his ancestors back until the early 1800s, before the onset of dementia cruelly meant that he became increasingly unable to pursue his many interests. I've been peeking in the folder on and off since Dad died in 2011 but it's really only now that I feel ready to try to take things on further a step or so if it's possible. The folder contains not only quite a detailed family tree but also several old photographs, a cassette tape (remember those) of one aunt and uncle (sadly no longer alive either) talking about life in their community in the 1930s, as well as several letters written in reply from people Dad had contacted during the course of his research. There also a couple of newspaper snippets, one of which describes a court case involving a murder trial. The accused was a relatively dim and distant ancestor but still I was most relieved to find that he had been found not guilty! I've now got the folder's contents into what seems logical order to me and I'm looking forward to more digging and delving whilst winter is still with us. As far as the dropping is concerned I'm now waiting with bated breath for the arrival of some new special snowdrops from Cornovium Snowdrops and Avon Bulbs. This involved much studying and brow furrowing whilst I made some difficult decisions. Now the deed is done, the orders have been made so now it's just a case of waiting for the postie. In the greenhouse where most of my specials are in residence there is already quite a show of white. If I thought that many of them opened early last year they are even earlier this year. I'm hoping for a sustained cooler spell to slow them down. I plan to take photos sometime this week. I'm especially keen to take photos of the unlabelled ones as some fellow snowdrop lovers might be able to help me put names to them. I'm also keeping the old grey matter occupied tackling this cryptic crossword . One lucky winner will receive a selection of unusual snowdrops from Colesbourne Gardens. Progress is painfully slow but I have a few weeks longer to work on it. Meanwhile out in the garden snowdrops have also opened during the last few days whilst several hellebores are on the point of unfurling. Exciting times are on the horizon but for now I'm content with indoor pursuits until that wind drops.What about you - are you braving the elements or keeping out of them? It was sometime back in the autumn when I started to hear a noise. I heard it in the kitchen. It was an unfamiliar noise - a distinct click followed by a whirr.... and then silence. In the following days I heard it regularly though not every day and if I did hear it it was only just the once. I could not work out what is was or where it was coming from. Strangely enough himself did not hear it so it was just my ears that were being assailed by a rather disconcerting sound. I became increasingly perturbed and searched high and low to see if could locate the source without any success. To my great relief himself finally heard it one evening but was then adamant that it was coming from the other side of the room to which I thought it was coming from. I dismissed this possibility as I did his suggestion a week or so later that it was just a normal everyday noise emanating from the fridge. Now after several years of intimate acquaintance with the fridge I knew that this was not the case. So the mystery deepened. 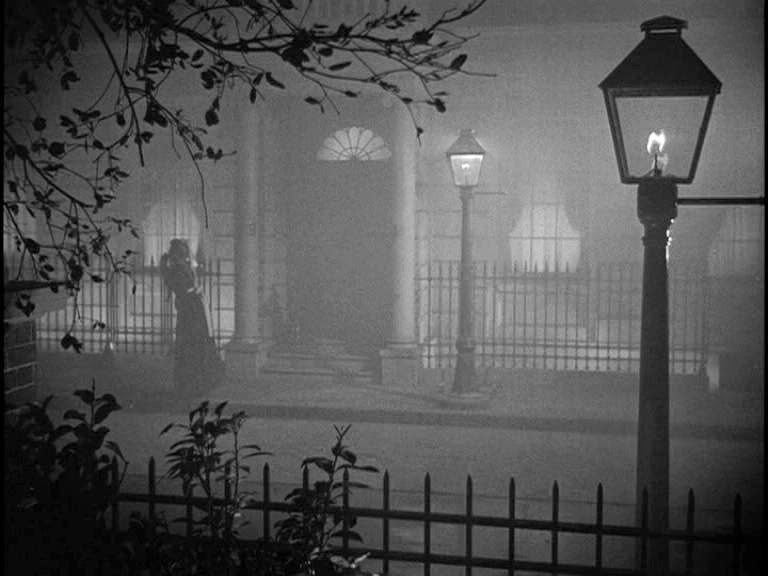 Shades of the film 'Gaslight' briefly flitted through my mind. If you have not seen this film it's a must for a dark, dreary indeed preferably murky afternoon at this time of year. Very briefly 'Gaslight' is a most scary psychological thriller in which evil husband attempts to drive wife insane by most subtle methods so that he can get his hands on her jewels. The heroine began to see and hear things ..... but I'm pleased to report than in this case that there were no sinister shenanigans going on. The penny finally dropped when logic came to my rescue. On hearing the noise the thought that it might possibly be time related came to me. So a thorough search of the kitchen ensued with my attention focused on time driven devices. Eureka - I found it! A couple of years ago we bought an automatic watering timer on holiday - no prizes for guessing where. Somehow or the other it had disappeared when the camper van was unpacked only to re-appear in the depths of the garage. I had taken it inside to insert batteries, test out my schoolgirl French, have a play after which I had put it aside in its packaging on the top of the Welsh dresser, along with one or two other ends of garden paraphernalia that seem to be ever present in our kitchen. It had been timed to go off at 6.00pm every night and had reliably been doing so! The beauty of all things doth appear." ~ " The Seasons' is one of the tracks on Loreena Mckennit's 'To Drive The Cold Winter Away'. Although the lyrics of the song give very short shrift to summer and one reference too many to the trigger happy 'sportsman' it reminds me what a glorious year we have to look forward to! May it treat anyone who passes this way gently and may your gardens flourish.